Moldavite is an olive-green or dull greenish vitreous substance formed by a meteorite impact. It is one kind of tektite. It was named by A. Dufrnoy from Moldauthein in Bohemia, where it occurs. It is sometimes cut and polished as an ornamental stone under the name of pseudo-chrysolite. Its bottle glass color led to its being commonly called Boute-illenstein, and at one time it was regarded as an artificial product, but this view is opposed to the fact that no remains of glassworks are found in the neighborhood of its occurrence, moreover pieces of the substance are widely distributed in Tertiary and early Pleistocene deposits in Bohemia and Moravia. For a long time, it was generally believed to be a variety of obsidian, but its difficult fusibility and its chemical composition are rather against its volcanic origin. Dr. F. E. Suess pointed out that the nodules or small masses of moldavite presented curious pittings and wrinkles on the surface, which could not be due to the action of water, but resembled the characteristic markings on many meteorites. Boldly attributing the material to a cosmic origin, he regarded moldavite as a special type of meteorite for which he proposed the name of tektite. To this type are also referred the so-called obsidian bombs and buttons from Australia and Tasmania, known sometimes as australites, and called by R. H. Walcott obsidianites. Similar bodies have been found in Malaysia and have been termed billitonite, from the isle of Belitung where they occur in tin-bearing gravels. Usually they are flat, rounded or ellipsoidal bodies, sometimes surrounded by an equatorial girdle or rim, and often with a brilliant black superficial luster, as though varnished. Moldavite has been reported also from Sk�neland in Sweden. 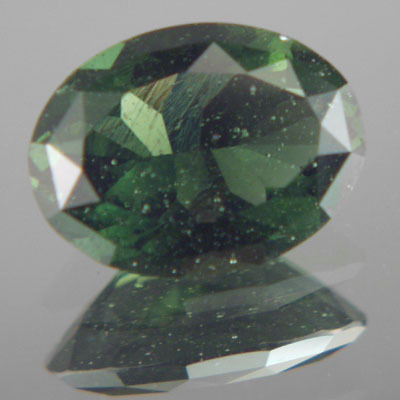 There are typically two grades of moldavite, high quality, often referred to as museum grade, and regular grade. You can tell them apart by the way they look - the regular grade pieces are usually darker and more saturated in a darker green color, the surface is seen as closely spaced pitting or weathering. They some times appear to have been broken apart from a larger chunk. The museum quality has a distinct pattern kind of like some sort of fern , and is much more translucent than the regular grade. There is usually a fairly big difference in the price between the two. The museum flower bursts are much more prized by the connoisseur. High quality moldavite stones are often used in hand crafted jewelry, and thus enter the market away from mainstream jewelry fashions, but more centered around art and craft, and as such have gained an almost cult status. 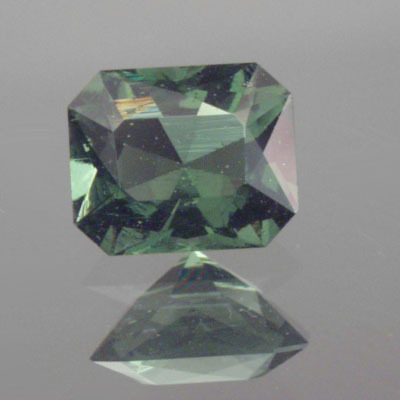 Moldavite of good quality can fetch a very high price, but even general comparisons put the stone's value at as 'that of higher quality large Amethysts'. Moldavite occurrences are reported from the Czech Republic, Austria and Bavaria.